Why carry a big heavy Flame Safety Lamp in addition to your Cap Lamp? Colliery Managers, Undermanagers, Overmen, Deputies and other 'Officials of the Mine' all carried large, heavy Flame Lamps. 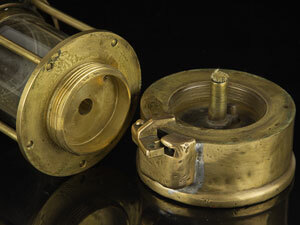 The Eccles, Type 6, Flame Lamp (above) was 25 cm tall (10 in) and weighed 1.375 kg (3 lb). 1. In the early days of coal mining, miners used 'open flame lamps' to provide illumination. These naked flames were a potential ignition source for methane gas (CH4) which is released into mine roadways (tunnels) from coal seams. Ignitions were serious, often catastrophic, and many miners lost their lives. Methane is a colourless, odourless gas which, when mixed in air, is highly explosive between 4.7% & 14.7%. Below this level it burns with a blue flame and above it, there usually isn't enough oxygen for it to ignite. 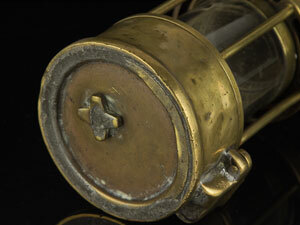 a) The 'Davy Lamp' - designed by Sir Humphrey Davy - enclosed its flame in a fine wire mesh. Enough of the outside atmosphere could pass through the mesh to sustain the flame, but the flame could not pass through the mesh to ignite surrounding gas. The mesh is located above the glass in a 'modern' 1950s Eccles Lamp. The 'Davy Lamp' undertook trials at Hebburn Colliery in January 1816.
b) George Stephenson's 'Georgie Lamp' was designed independently and provided more light. He used very small holes to prevent the flame from igniting methane. Because Stephenson's education was very modest in comparison to Sir Humphrey's, it was assumed that he had stolen Davy's design. He was finally exonerated in 1933 by a House of Commons Committee. Stephenson demonstrated his 'Geordie Lamp' at Killingworth Colliery in November 1815. He took it underground and held it up to a crack in the strata which was leaking methane! The 'Geordie Lamp' was used exclusively in the North East of England and the 'Davy Lamp' was used everywhere else. 3. 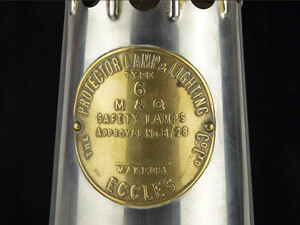 Flame Safety Lamps were designed to provide (limited) illumination without the risk of fire or explosion. 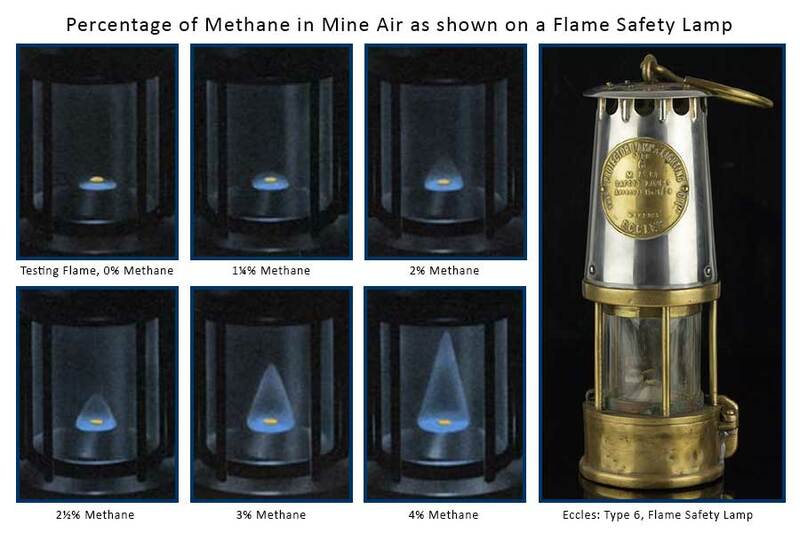 They also have two other highly desirable properties - they can show a trained operator the exact percentage of methane in the general body of mine air and, if the lamp is carried into oxygen-deficient air, the flame will be extinguished at about 16% oxygen, thus alerting the miner that he is in serious danger. This is why Mining Engineers and Colliery Officials always carry a Flame Safety Lamp in addition to their very efficient modern cap lamps. Safety of the men in their charge is paramount! Normal Oxygen Level: 20.8% - 21.0%. 19% - increased breathing rate and some adverse physiological effects. 16% - increased pulse & breathing rate; impaired thinking & reduced coordination. 14% - abnormal fatigue; emotional upset; faulty coordination. 12.5% - very poor judgement & coordination; impaired breathing; nausea / vomiting; possible permanent heart damage. Less than 10% - inability to move; loss of consciousness, convulsions; death. 4. By law: as soon as 1¼% methane is detected in the general body of mine air, all electricity is switched off in the affected district and all activities that present a significant ignition risk are halted. Electrical sparks are highly improbable (due to equipment design and installation standards) but sparks from the picks of coal and rock cutting machines, such as Shearers and Dosco Mk4s, are a distinct possibility. At 2% methane, men are withdrawn from the district. The electricity remains off and miners do not return to their places of work until methane percentages are reduced below these legal levels - usually by ventilation specialists led by an Undermanager. Could only be opened and lit in the Lamp Cabin. An identity number was stamped on this badge. The fine wire mesh is enclosed within. Senior officials' lamps had a re-lighting device fitted. Why was every miner obliged to carry a Self Rescuer? Following a series of trials beginning in the mid-1950s, the introduction of Self Rescuers into NCB mines began in 1967. The carrying of these life-saving devices for all underground workers became a condition of employment in 1968. 1. Carbon (C) burns in an ample supply of Oxygen (O2) to produce Carbon Dioxide (CO2). Fires / Explosions in coal mines usually result in a limited supply of Oxygen to 'feed the flames', resulting in the production of Carbon Monoxide (CO), a highly poisonous, colourless, odourless gas. 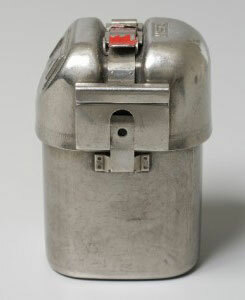 Self Rescuers were designed to protect miners until they could move into safe, well-ventilated areas. 2. 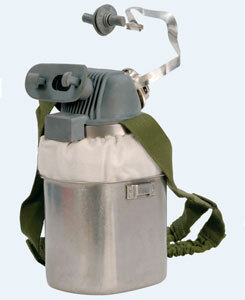 The Self Rescuer is contained in a metal case and is carried on miners’ belts. 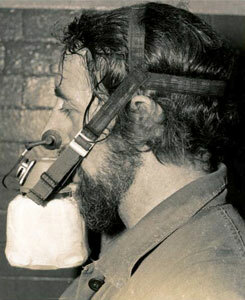 In the event of a fire, the case is opened to reveal a mouth-piece, breathing apparatus and nose-clip. Within the apparatus are chemicals which turn the poisonous Carbon Monoxide into Carbon Dioxide. It is designed to give up to 90 minutes protection, enough time for a miner to leave an affected district. Self Rescuers cannot prevent asphyxiation in oxygen deficient air; they are 'aids to escape' and can only be effective when there is enough oxygen in the surrounding air to support human life. They weigh approximately 1kg. 3. Each miner was trained to use the device and his competence was retested, at the surface, every two years. He would answer questions on its operation, open and wear the breathing apparatus & nose-clip, and climb over and under tables, chairs etc. until the examiner was satisfied that he was capable of recognizing a dangerous situation and rescuing himself from it. 4. An unpleasant side-effect of the conversion from CO to CO2 was an exothermic reaction - the release of heat. It's very tempting to remove the apparatus or nose-clip to get a breath of cool air but doing so could be fatal! Breathing hot, dry air showed that the Self Rescuer was working as designed - Carbon Monoxide was being converted into Carbon Dioxide. It was saving your life!